I went out and bought a clear epoxy resin kit and a silicon moulding kit at the weekend, so I’ve started playing with resin casting. 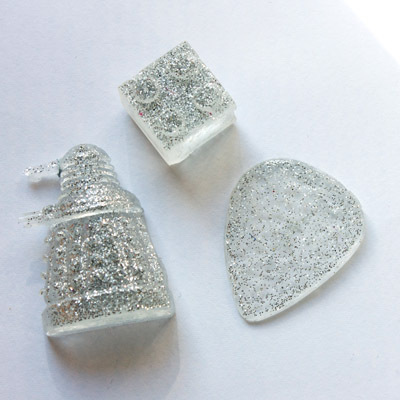 The first moulds I made were of a dalek and a lego block, and I put glittery clear resin in them and they look brilliant! Some friends on twitter suggested the glittery daleks would be great for christmas decorations and I think thats a great idea! I’ll be playing around with moulds and casting a bit more before I get it all perfect and start selling them. I may even look into making my own small run of art toys! I also injured myself yesterday with a scalpel while trying to make small holes in plastic. I have bought myself a small push drill now to try and avoid injuries in the future!